My life . . .
My influences . . .
My reviews . . .
My music . . .
… Midnite Johnny has released CDs including “So Complicated” January 2015 on Mosher ST Records; “Lyin’ Eyes” and “Boogie and Blues Review”. His material ‘Hello Trouble’ is also included on “Keeping the Blues Alive. Vol. 7” and has also been included on the compilation CD ‘Showcasing the Blues – Vol 2’ with ‘Lyin’ Eyes’ featuring in the soundtrack of the HBO movie Suicide Blonde. “‘Hello Trouble’ is straight up, smokin’ blues the way it should be done – consuming vocals, with absolutely relentless and scorching guitar leads backed by profoundly rich rhythm. MJ shines on this one”. “Midnite Johnny’s Lyin’ Eyes transports the listener to a front row seat at the House of Blues. This CD, which was recorded, mixed and mastered in Fort Lauderdale, Florida, is an excellently produced and arranged blues CD. All the typical blues hooks are present and each track has enough variety to make it sound different. 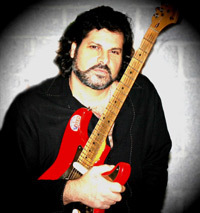 Not only as a producer and arranger, but lead guitarist and vocalist, Midnite Johnny plays great lead blues guitar riffs, especially on his songs Trouble Fallin’ Down (like rain) and Lyin’ Eyes. "Lyin Eyes is not your regular, run of the mill blues. There is a great show of diversity which absolutely makes this CD a welcome addition to any blues collection”.